Savannah, Ga. is one of my favorite cities to visit. 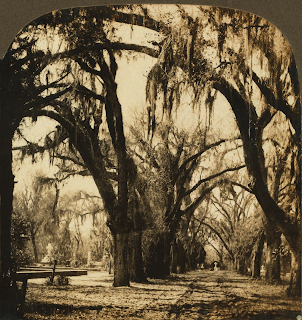 Courting Holly (my next novel with a fall release) was set in 1882 Savannah. This naturally allowed me to visit once again. There are some little known facts about Savannah you might not be aware of. Savannah did not have large cotton plantations, even though Savannah was one of the largest cotton selling ports in America. Rice plantations made up the greater share of the plantations. Another interesting tidbit is that of Bonaventure Cemetery. It was established in 1882 as Evergreen Cemetery by Peter Wiltberger who opened it to the public. Prior to that it was a private cemetery for the families who lived on the plantation. Here’s a picture of the from the 19th century of the Bonaventure. The family plots are small and many were fenced in. Here’s an example. 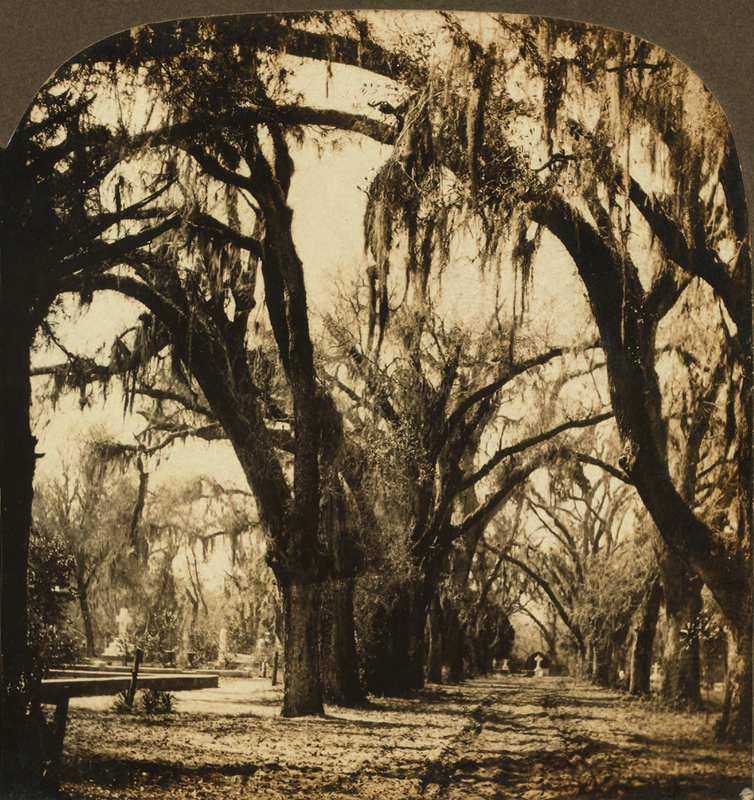 Another fun tidbit about Savannah that dates before 1882 and more into the 18th century was the use of ballast stones. As ships would load their vessels with stone to help weight them down and stabilize them when they were less than full, these stones would need to be removed to make room for cargo. Today you can travel on many of these ballast stoned streets on the waterfront. And the last, but certainly not the least, tidbit about Savannah is the squares designed by Olgethorpe when he founded Savannah in 1733. These squares make the city an interesting place to visit. Which was Olgethorpe's original plan, to have a place where neighbor could meet with neighbor. He also designed the streets so wide that even today you can have cars parked on both sides and have traffic going both ways. As you go further south in the city the streets become narrower. There are so many things I love about Savannah, but walking the streets, soaking up the history and enjoying the architecture are only a few. Perhaps your travels will allow you to go to Savannah one day. Courting Holly won't be coming out until the Fall. But if you would like to enter a drawing for Key West, a collection of four historical novels set in Key West, simply comment on this post and you'll be entered into a drawing for that as well as the items below. Before I even began reading your post, I thought of two things: Ms. Debbie Lynne + Ms. Paula Deen! Smiles. Being a girl whose captured the unending joy of road treks, I have passed through, stopped for lunch, and otherwise been entwined with Savannah as anyone else whose driven up the Eastern Starboard via I-95 can attest! :) Like her counterpart of Charleston, Savannah yields a certain allurement that reminds me of New Orleans! There are timeless cities in our country that evoke a romantic sense of awareness that cannot be compared to others,... some for their historical signficances and some due to modern romanticisms that are keyed in to our visceral yearnings as a society. I know of the rice, because I've purchased Jasmine rice in a special cloth bag that is meant to be frozen to say fresh, and I was happily surprised to unearth a partial history of Southern planted and harvested Jasmine rice!! Small world! :) Ontop of which, I learnt its best that the rice fields and the cotton fields do not overlap upon each other, due to cross contaminations... oyy. Ooh your photographs remind me of an oak lined avenue nearby that has the same essence of century old mirth,... certain places are simply ageless, are they not!? And, cementaries! Ooh the stories they could echo, eh!? I love walking through them! Not only for the readings of stones, but the graceful peace and serenity of being 'present' and 'reflective'. I adore angel statuary as well! :) The gothic-esque adornments and elemental accompanients are always essential! As far as I am aware of, colored only referenced African-Americans,... I wish I had had the chance to walk the streets, its always the best way to soak up the local flavour and atmosphere of the city!! Thank you for this guided tour of a city I've traversed through moreso than enjoyed the pleasure of acquainting myself with directly! OOh, now Key West -- that's a subject of another feather!! Eek! Who wouldn't enjoy a journey of narrative set there!? Ooh boy!! Thank you for this bookaway, but I will also keep my eyes peeled for Courting Holly! Thank you for sharing Jorie. If I had bothered to come online at 3am I would have seen your post then. I too am a late night kid of a gal. I love the city of Savannah! I think of the pecan pralines! We visited the city and walked around a few years ago. I want to go back again. A city filled with history. I did not know about the rice plantations. Thanks for sharing! I will be on the lookout for your new book! I love hearing about Savannah. Of course, Paula Deen raves about Savannah all the time. Would be fun to visit. I still have not stopped at Paula Deen's restaurant, another reason for another trip to Savannah. I have never been to Savannah. In fact, the only place in Georgia I've been to at all is the Atlanta airport! But I would love to visit some of the fascinating places in the South like Savannah. Been to the Atlanta airport a few times, doesn't really reflect the state. Not a bad airport but man if you have to change terminals and they are at different ends...can I say workout. I would love to be entered into your giveaway. Thank you for the chance. Get your sister to come along for the ride and make it a special getaway for the two of you, you'll be glad you did. I would like to visit a all of these places somday. Time and money prevent us from going everywhere. I have a huge list of places I want to see, just don't have the budget for it yet. I live in SC and have visited Savannah briefly on two different occasions. Once was only for lunch when we were on vacation on Hilton Head Island, and another time when I was a teen my family spent a day there during the spring when the Azaleas were blooming! Beautiful place, I would love to spend more time there at some point. Azaleas in bloom are spectacular. We have them in Northern Florida too. This year they came out during a warm spell at the end of Jan and early Feb. I love reading and learning about the south. Thanks for the opportunity to win. You're welcome thank you for taking the time to enter. From MO & now live in WI. Have travled a lot, but never been to Georgia. Right now I have my sights set on Oregon and Washington state. Two places that are on my list as well. We're hoping to go out West next Spring and stop at the Red Woods in California. My husband's brother has taken a job out there, so a visit would be in order. I have never been to Savannah, but it sounds like a delightful place to visit with lots of history. A gal in my church is from Georgia and has mentioned Savannah on occasion. It would be fun to visit there someday! Thank you for the opportunity to win! It truly is a remarkable city the history and the current culture make for a great mix, imho. I enjoyed reading your post. Savannah is on my list of places I would love to visit. I think it has a lot of history. Definitely has a lot of history, I barely made a dent on it. Hi Lynn, I love to visit other countries and areas, but am limited to doing it through the eyes and words of great authors! The advantage to that though, is that I am not limited to real time! Thanks for the opportunity to win this collection! Isn't the imagination great? I go so many places when I'm reading and writing. I've even traveled to different planets. Absolutely love Savannah - the history, houses, trees, southern cooking, etc., etc. Haven't seen Bonaventure Cemetery - visited Savannah several years ago, but not enough time to see all that I wanted to. Love the Hilton Head, Beaufort, & Charleston areas also & did visit a Gullah cemetery while in Hilton Head. Another place on my list of places to travel are the Florida Keys - have heard the water there is equal in beauty to that of the Caribbean. Would love to win the collection of books set in Key West - thanks for the opportunity! You're entered. Do visit Bonaventure when you travel to Savannah again. It truly is a marvelous place. I found some interesting planted flowers there as well. I find Savannah enchanting as well...all of the history and Old southern charm is simply wonderful...great time period too just after the war when things were really happening. How interesting that the same streets are wide enough for today's traffic and side parking! Four-wide horse and buggy trails! Also like the new photo of the same lane. Martha J. Sturm ~ we are reversed from you! Olgethorpe had vision for the future it was great planning on his part. I love going to Savannah. Thanks for the giveaway. Intersting. I had no idea why the streets are so wide. Good planning. I just love that city. What did happen to Savannah during the Civil War? Were they blockaded? Sherman marched to the sea, did he end in Savannah? Yes, he did stop in Savannah but after the people of Savannah ran out to meet him so that he wouldn't burn the city. He then made headquarters in Savannah. The Savannahians did sink a lot of ships in the mouth of the river to prevent ships from coming into Savannah. Rice? Really? I always associated it with cotton. I have been learning so much from these posts. Great article, thanks for sharing, and the pictures are very pretty. God bless. Thank you and yes lots of Rice. Lynn - LOVE the pics! I'm always so patriotically impressed by the nuances of our country. Places like Savannah may have been inspired by other nations/countries, but we've made it our own, haven't we? As a child visiting that area, I remember the moss hanging off the trees. Early morning fog would bring the moss to life...or maybe just the imagination of an eight-year old avid reader did the life bringing. The rice info surprised me. Your imagination was working quite well. The sway of the Spanish Moss on the trees during the fog can bring all sorts of images to mind. I've never been to Savannah, Georgia but it sounds like a wonderful place to visit. I have read Savannah from Savannah; Savannah Comes Undone; and Savannah By The Sea. They all give you an insight to the beauty of Savannah, Georgia. Thanks for having the giveaway. Hopefully you will get a chance to visit one day, it truly is one of the unique cities in our country. I have never been to Savannah, Georgia either, and I am quite sure I would love to wander through the city! You would love Savannah if you love history. Thanks for posting a response. I live in NE Georgia, but have never been to Savannah.....always wanted to! However, I have visited it through many books and loved that! Would love to read your giveaway books!!! Thanks for posting Jackie and hopefully you'll get a chance to visit Savannah one day. One of my next trips will be to Northern Georgia. I've been to the NE corner many times, Toccoa and Helen. Oh, just noticed where you live.....I have been there several times many years ago.....loved it! An aunt/uncle (deceased) had a home on some lake there (Santa Fe??!). Headed to your blog now to learn more! Yes, Santa Fe lake is near our house. We've been boating on it a few times. It's a great lake to enjoy. Savannah is a lovely city and I loved learning more about it. Love your blog. As a teenager I spent my summers with my aunt in Savannah. It's one of the most unique cities in the world with those precisely drawn town squares and small enclosed gardens. Many Blessings on you and your family for Easter, Elaine. What fun to have summered in Savannah. Did you venture out to Tybee Island for swimming in the ocean much when you were young? I haven't visited the south but would like to. Savannah sounds like a very interesting city. There are many, many places to see in the South as their are in the North, East and West. I have started to refer to myself as a Southern Yankee. Born and raised in New England with family back to the Mayflower, last count was 13 ancestors were on the ship, I will never be rid of my Yankee roots. But I do enjoy the south as well. Thanks for replying and entering to win, Maxie. Here's hoping you have an opportunity to get there one day. It is a great place to visit. Savannah is a beautiful place to visit! Thanks for the post! You're welcome, thanks for responding. Loved your post on Savannah...have never been to the South...sounds like a real interesting place...so full of rich history...thanks for the giveaway. Hopefully you'll get a chance to visit Savannah and the rest of the South one day. I have always wanted to go to Savannah, GA. My friend Sheila who lives in Savannah has been trying to get me to come for a visit. Hopefully one day I will be able to. You're friend will love showing you the city. Thanks for taking the time to post.